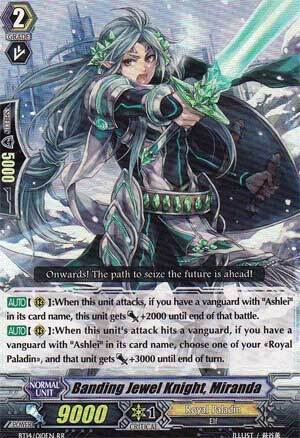 [AUTO](RC):When this unit attacks, if you have a vanguard with "Ashlei" in its card name, this unit gets [Power]+2000 until end of that battle. [AUTO](RC):When this unit's attack hits a vanguard, if you have a vanguard with "Ashlei" in its card name, choose one of your «Royal Paladin», and that unit gets [Power]+3000 until end of turn. Escaped, and it was so short. "Scale for 18k," he said, "She can force more guard with ease." Quoth the reviewer, "Next card please." Remember Ashlei Reverse? Well, here's one of the better cards to search for her. Capable of hitting anything that's not a crossride without a boost, her second skill lets you power up one of your Royal Paladins, doesn't even have to be a Jewel Knight or an Ashlei unit by an extra 3000 power. Let another Miranda swing in at 14000, make Ashlei Reverse 26000 on the crossbreak ride without a boost. It's a solid card that should be in any Ashlei Reverse deck for sure.